NICE CATCH FOR MY BIRTHDAY! 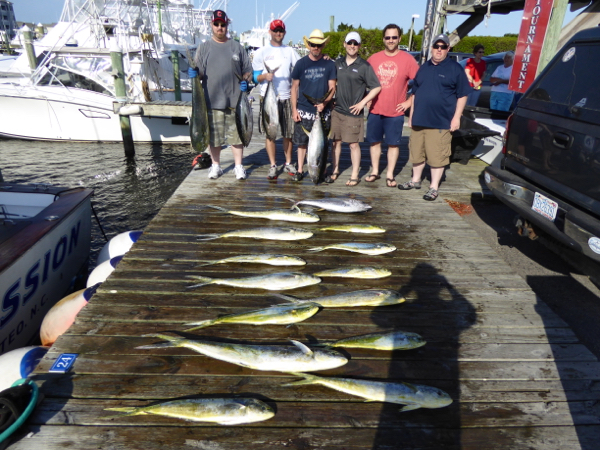 John Tierney, who has fished with me for 20 years along with Devin, Jay, Brad & Andy, all from North Carolina & Virginia, boated a nice catch of 20-40# yellowfin tuna and 5-20# dolphin, and my wife had a big boston creme pie layer cake for me when I got home!! FIRST MEATFISH GRAND SLAM OF THE YEAR! 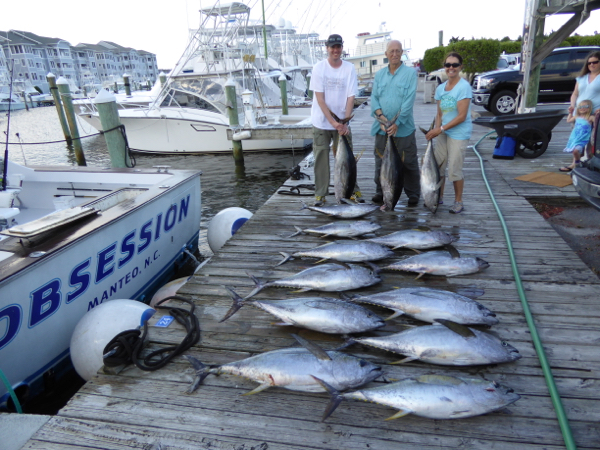 Earnest Spates of Hopewell VA boated a 53# citation earning wahoo on his first offshore fishing trip, and the rest of his crew boated a boxfull of 20-40# yellowfin tuna and a few big dolphin. Seas were still substantial after the tropical storm and only a few boats went today, but I was glad to have a tough group.... Paul Winters, Becky & son Scott caught a scattered but nice size yellowfin troughout the day, but with time running out we had about 5 get after us and missed every damm one of them.....Lee and I were about to scream, but we rerigged, made a circle and hooked 7!! Paul, Becky & Scott cranked them all in and we were homeward bound!! I'm glad David Cook & his crew from Deleware are tough cause it was all you wanted yesterday..... 7 ft seas from the tropical storm off South Carolina hit was when we got into the hot water and we set out along a hard to follow change that was a hobgobeld mess to say the least.... 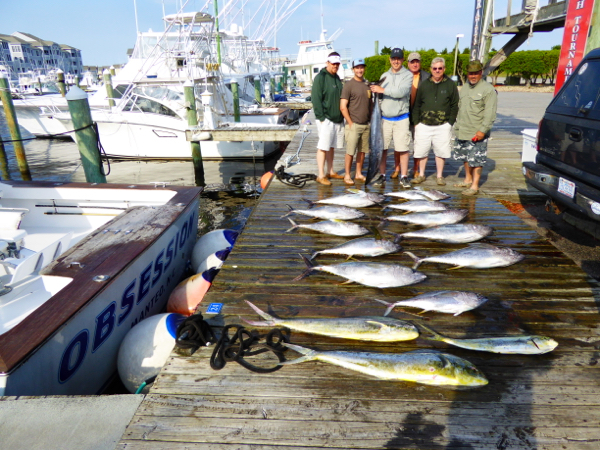 Took 15 minutes for me and my dock partner Bull on the Sea Toy to get the courage to lower the outriggers, but all in all the day went well once we got things dialed in..... picked away at 5 -20# dolphin all day long they guys all hung in there and caught a lot of the fish on light tackle..... had so much fun they booked the same day again for next year! TROPICAL STORM DID"T SLOW THIS GROUP UP! 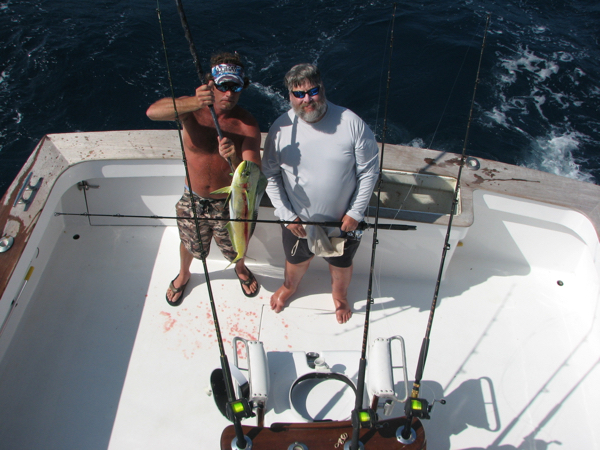 Kevin O'brien and crew, who have fished with us the last 5 years were not worried about the tropical storm south of us and conditions were better than we expected. 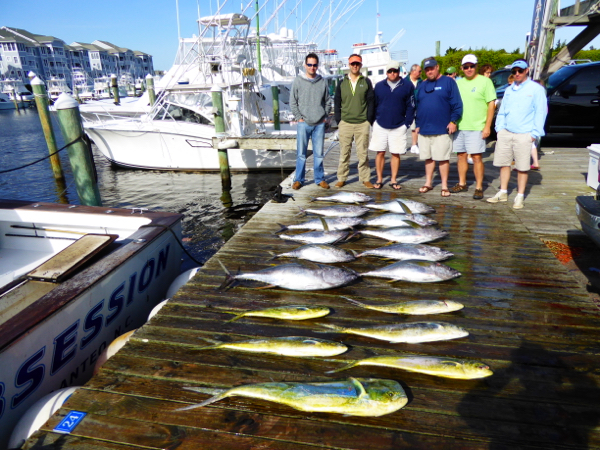 Paul Ebert, Phil Quam & their crew from Maryland have fished with me for a number of years, but said their trip a few days ago was as good as they had it�.we picked at fish all day, catching 15 1/2 yellowfin tuna from 20 - 40 lbs, 5 nice dolphin, and we released several mako sharks that were too small to keep and had several large ones destroy our rig. Had action all day long. Scott Sumners and I had a not unpleasant boat ride home from Mexico two weeks ago.... made the trip in 4 days....choppy crossing the Gulf to Key West, but nice weather the rest of the way.... crossed the Gulf in 21 hours, stayed in Key West overnight, ran up to Ft Pierce the next day, got fuel at the yacht club and mullet and stone crabs from KP around sunset and headed back out....made it to Fernadina beach by sunrise, fueled up and kept going, making it to Southport by sunset....stayed there overnight and made it back home the next day. 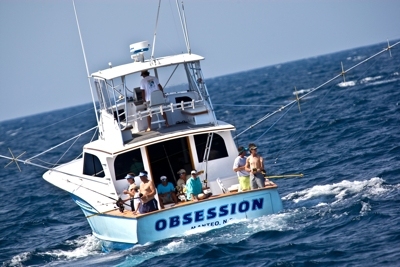 My first charter is April 11 but with Oregon Inlet temporarily closed, don't know what I will do next week....Dredges should begin work this week so hopefully we will have a way out of Oregon Inlet maybe in the next 2 weeks. 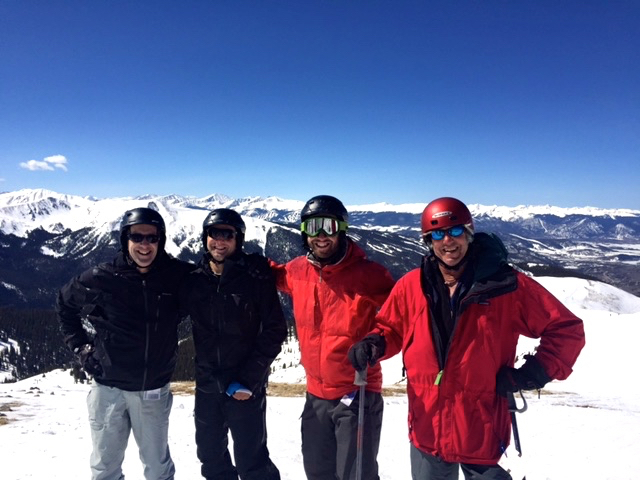 Had a great 3 days of skiing with my brother and his two sons at Breckinridge and Aprapahoe Basin this past weekend. GREAT PHOTOS OF OF THE LADYS TRIP! Sheila Tripp, from Edenton NC, who fished with us along with friends Tiffany & Katie this past week provided me with some excellent photos from their trip. GRACIAS SENIORITA! 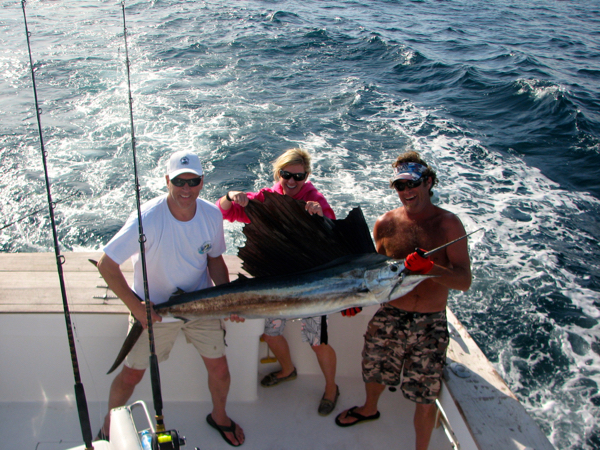 Rob Brown and his wife, from Poquosan, VA, had good action releasing 9 sailfish, including 5 that Rob hooked himself. We will be heading home maybe this Sunday or Monday. GREAT SAILFISHING TILL THE BONITOS MOVED IN! 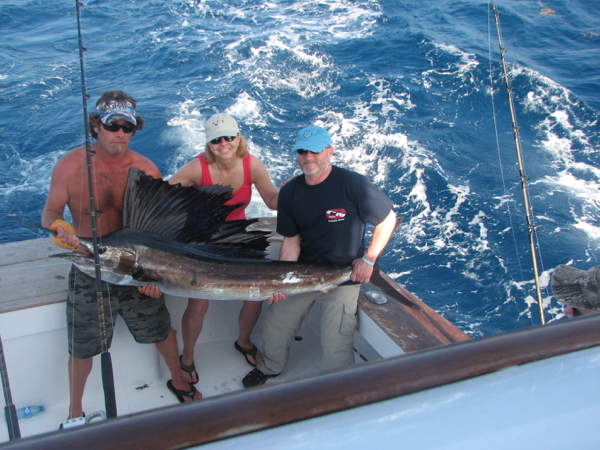 Paul & Becky, on their fourth and last day, had great sailfish action, catching 13 sailfish out of 21 bites, including a double and a triple header and that was all before 2 PM.... after then the bonitos moved in.... could not keep a ballyhoo out there..... had sails chasing teasers and bonitos getting the pitch baits before the sails could.... after they ripped on of my chain teasers off and destroyed one of my dredges we called it a day. 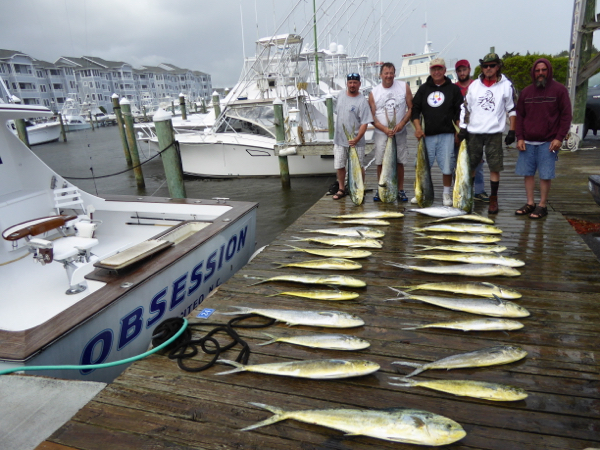 AN EXCITING HALF DAY FISHING TRIP! 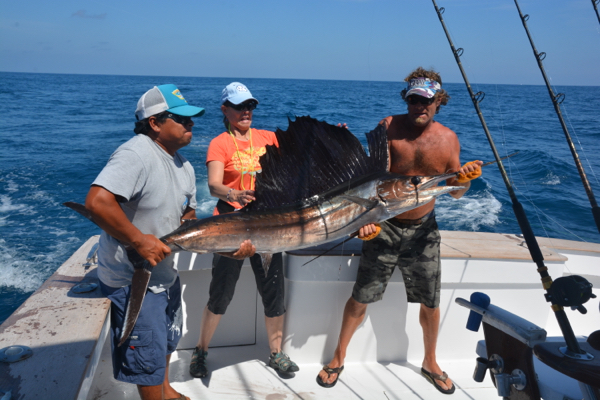 On their second half day fishing trip, Shiela, Tiffany & Katie each caught 2 sailfish.... the girls are great anglers and did a good job in choppy seas. 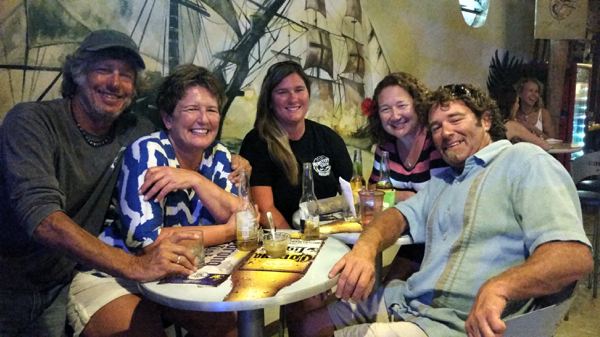 Their first time down here, they had a blast and are planning on making Isla Mujeres and annual adventure. They kindly took Scott & I out for a great dinner at Morgan's restaurant where I made a pig of myself eating two lobster chili rellenos! Paul Winter & Becky, on their third of four days fishing had good action today, releasing 10 sailfish out of 19 bites, including 2 double headers.....we were only 1/2 hour from the island and the waves of bonitos terrorizing us yesterday were elsewhere....with full moon coming up, the next few days should be good fishing and then we are done! 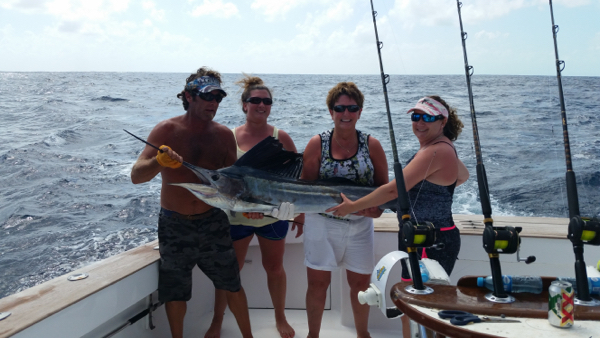 Choppy seas and waves of bonitos flashing in the waves....so many we had to vacate the area wanted to fish but mangaged to find some bait and sailfish.... Katie, Shiela & Tiffany, from Edenton NC along with Kevin Wuchter & his friend....everyone caught a sailfish in a half day trip..... I only do these in March when the fish are close and the season winding down...the ladies will be fishing with us again on Tuesday and we have trips tomorrow and Thursday and then prepare to head back to North Carolina. 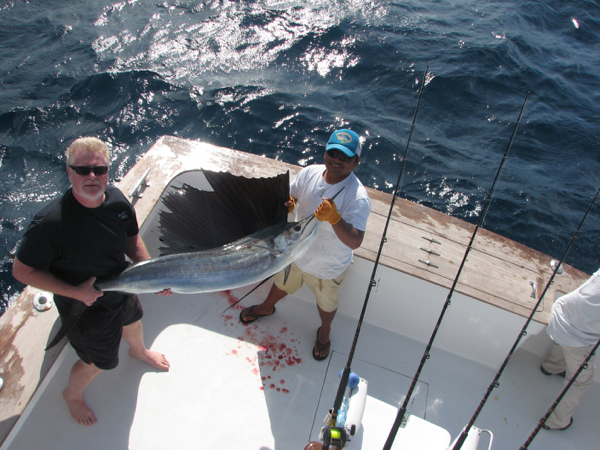 SAILFISH SCATTERED AROUND BUT NOT THICK ANYWHERE! 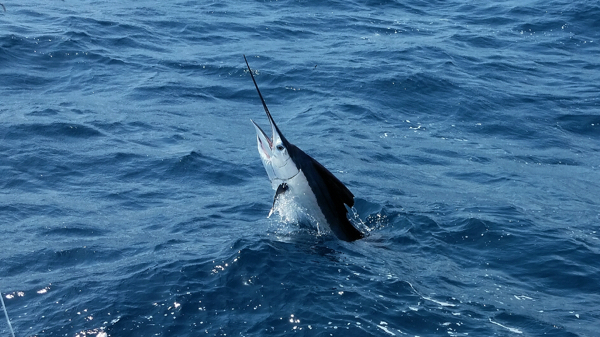 Yesterday we fished outfront for a half day with Rusty Garrett & his crew from Florida and North Carolina and caught 7 sailfish out of 10 bites including a double and triple header. 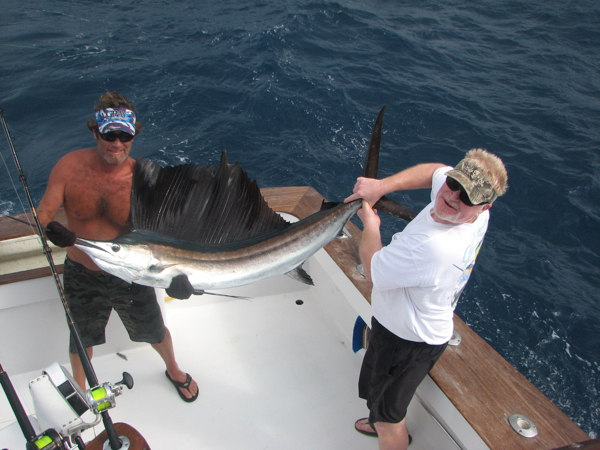 Today we ran up north with Charles Spangler and caught 6 out of 7 sailfish bites..... Charles was 100% hooking fish! 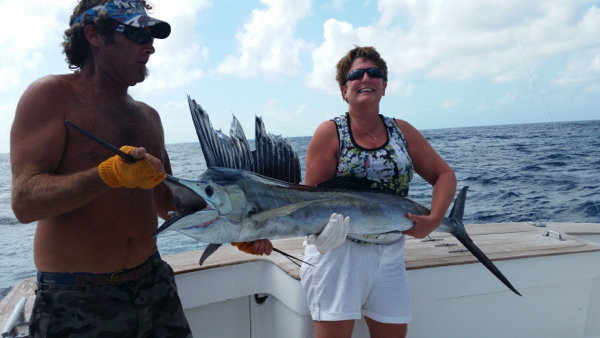 Rough seas yesterday, and cold green water up north today kept us fishing close to the island the last two days.....Yesterday Tom Palmers wife Cheryl & Ricky Dickens wife Debbie each caught sailfish in challanging conditions. TRIPLE HEADER TO END A TOUGH DAY! I WISH THESE DAMM THINGS WERE A BIT CLOSER! 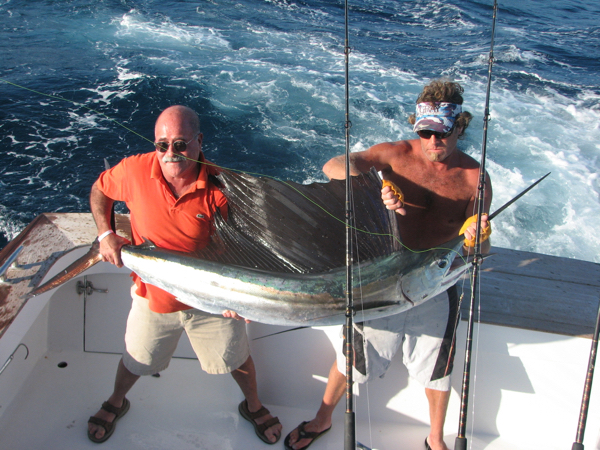 We were 65 miles from Isla Mujeres today.... as far as we have ever been, but the fishing was again sensational.... Brian McAvoy & crew had non stop action around birds and balls of bait....one or two at a time but they released 41 sailfish by 1:30 and we headed in early as we had a long long head sea ride going home. Joshua Bauer, Capt David Grubb & crew had fantastic action today as we ran 60 miles up north....The guys released 45 sailfish, most around several bunches of birds, but some caught trolling including a triple header and a wild 6-banger, in which we pulled off several others but had everyion hooked up and caught all 6 of them.....the guys are all good anglers and hooked all the fish themselves! 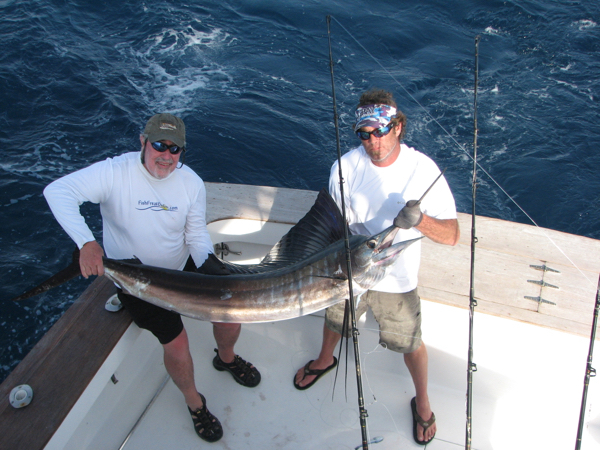 We also boated 2 35# wahoo. 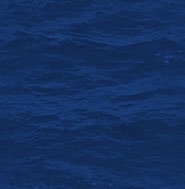 WHERE DID THEY ALL GO! 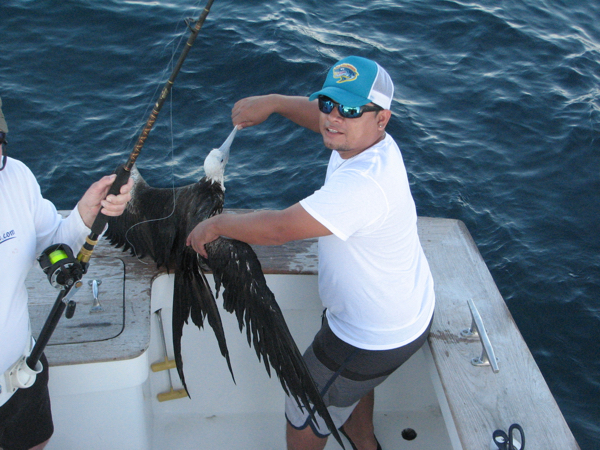 We had a good sign of fish out front the last week and the bait is still there, but bites were hard to come by..... Bryan & Nick caught 7 sailfish out of 10 bites. 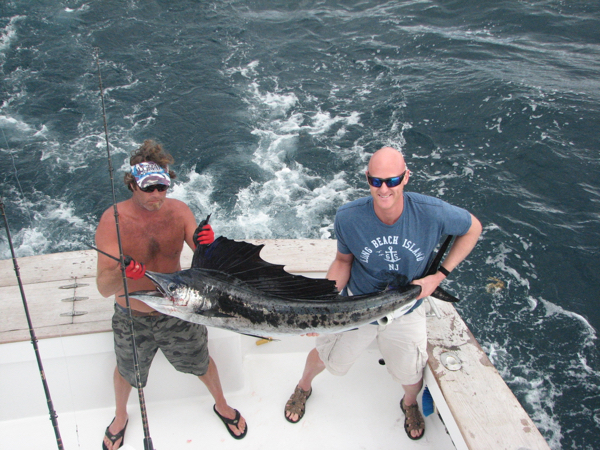 Marty & Jason, who have fished with me for the last 5 years down here enjoyed their second day of fishing, again catching 14 sailfish out of 18 bites.... real good action way up north today may force us to burn some fuel tomorrow! GOOD FISHING CLOSE TO HOME FINALLY!!! 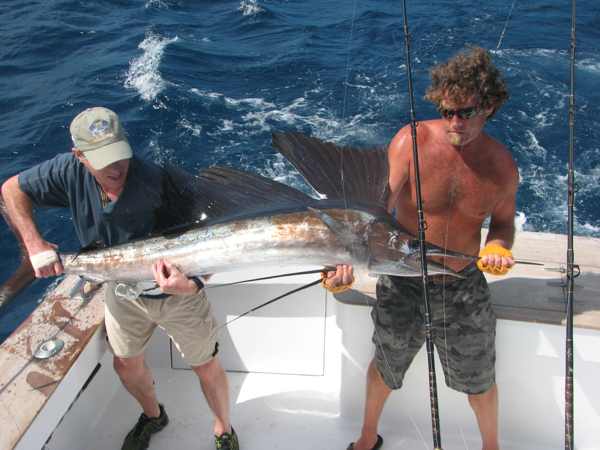 We had good action trolling and around birds only 11 miles from the island today instead of the 40 we have been running all season... nice change of pace..... Marty Segal and crew released 14 sailfish today, but we should have had 20 as we had the bites but couldn't hook them for some reason....alot of that going around today as it was rough and the fish were tailing down sea and not bitting real good. WE HELD OFF THE COMPETITION TO WIN THE TOURNAMENT! 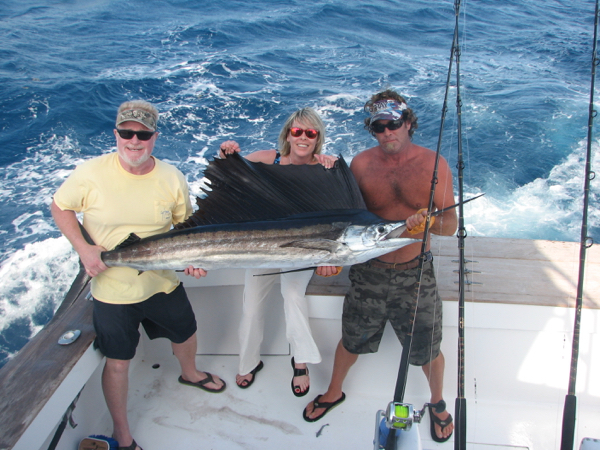 Rick & Joane Schall & their crew of Thomas & Scott did a great job hooking & catching sailfish yesterday.... we got a good start with a single and then a triple around some birds, but the Sea Hag got going in the afternoon, but the crew took advantage of most all our opportunities, catching 13 of 18 sailfish bites so we ended up top boat both days, winning the Little Yellow School House Island time sailfish tournament and Thomas Meligan took first place for the anglers top prize, hooking and catching 7 sailfish over the two day period..... We enjoyed a couple of great meals and three nights of outstanding music complements of several Nashville songwritters who contribute their time and talents to a great cause.... we raised close to $30,000 for the Little Yellow school house for local handicapped children! 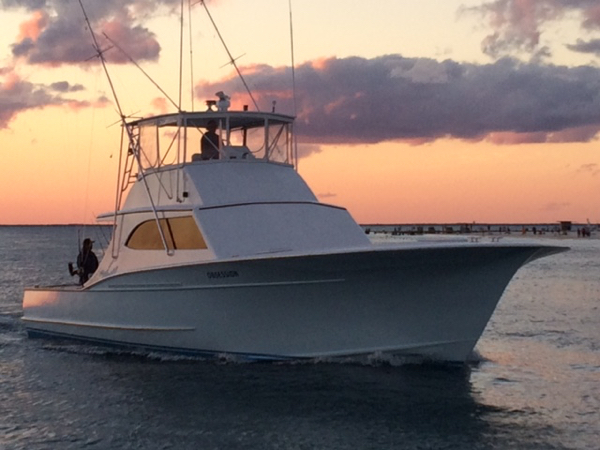 Yesterday we fished our first of two days in the Island Time Sailfish Tournament. 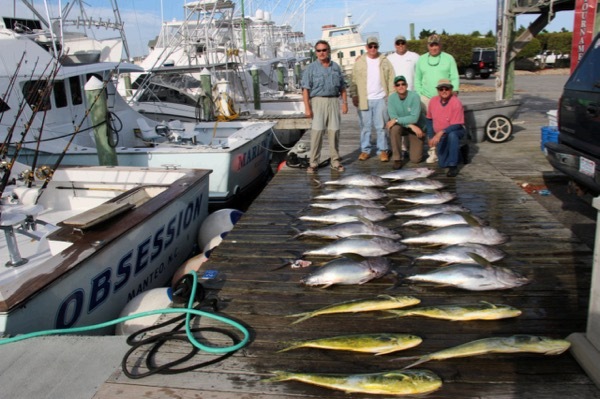 There are only 10 boats participating this year, most from Enriques Marina as the other marina is half empty this season, which makes for nice fishing as the grounds are less crowded.... Anyway, we had a good day in spite of slow fishing and ended the day with 7 releases including two triple headers to give us a one fish lead over the second place boat. 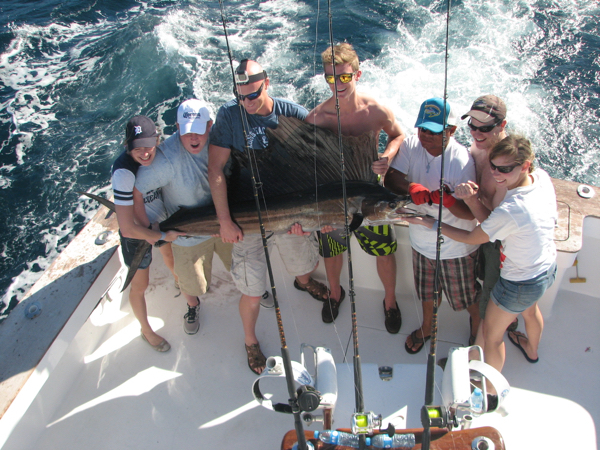 Rick & Joane Schall & their crew of Thomas & Scott did a great job, and Thomas Meligan is in first place for the anglers top prize. 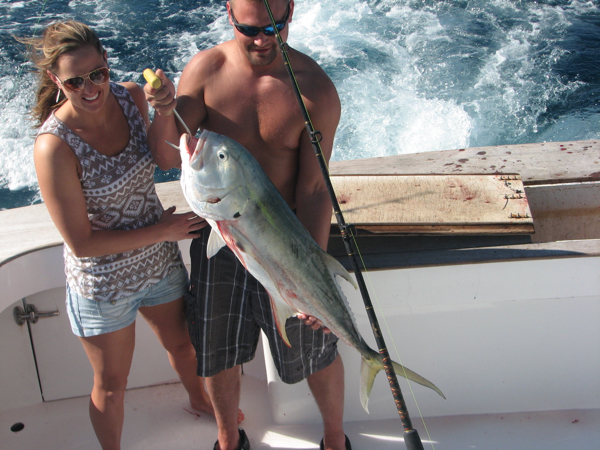 BEAUTIFUL WEATHER AND GREAT FISHING! Calm seas and lots of action..... Tony C, Big John (from Maryland) and Stanley & John Yarborough had plenty of action today including a double header, of which there were at least 4 back there, a triple header out of 4, and a quadruple header, off which when we cranked up the dredge there were 4 sails around it....we ended up hooking 6 fish but only caught 4 of them, one pulling off as we reached for the leader, and that one would have given us 20 for the day. 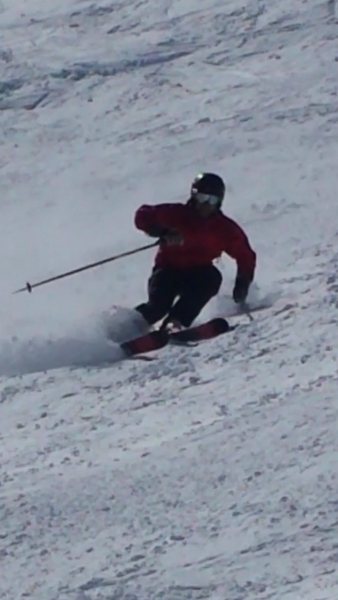 ACTION MOST OF THE DAY! 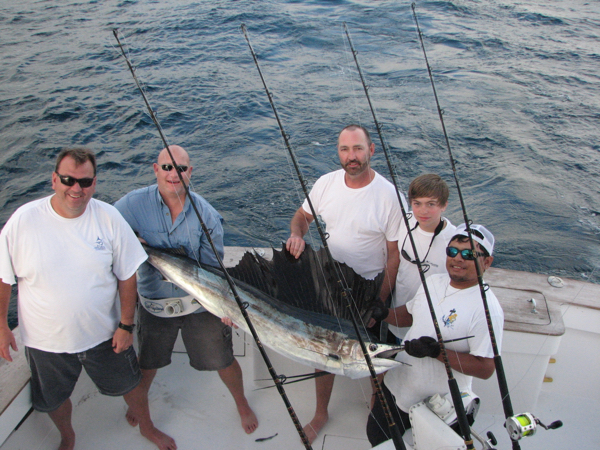 We never could hook more than one at a time.....maybe a double or two, but Tony Cameron & John Knight of NC and Stanley & John Yarborough of Hilton Head, released 16 sailfish out of maybe 25 bites, with John and Tony hooking many of them. 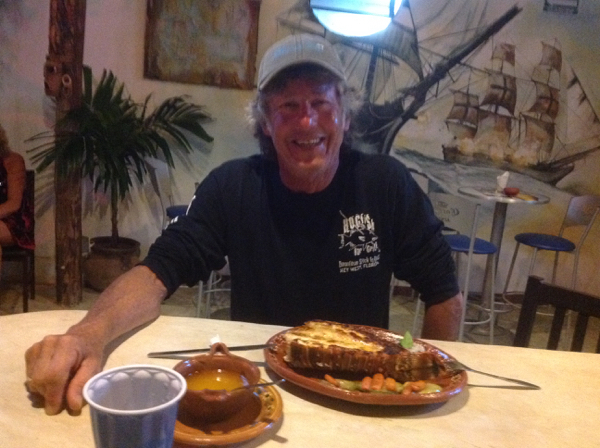 We are headed to Miguel Morgans to eat our by-catch.... for some fresh blackfin tuna and mahi cooked a few different ways. TRIPLE HEADER ENDS A GREAT DAY! 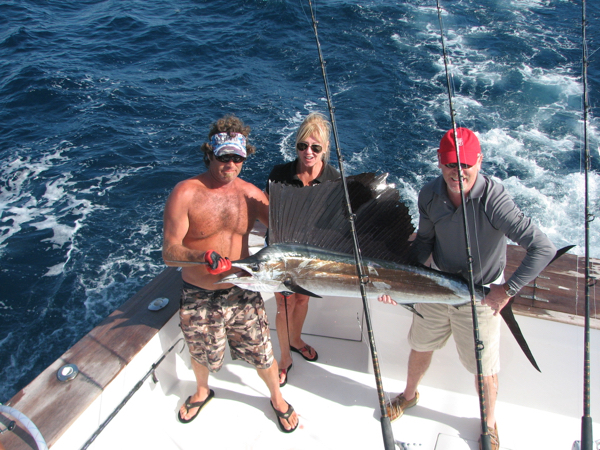 On their second day of fishing Jim, Nancy, Ed & Lisa again released 15 sailfish, including 5 around birds to start the day, and then in spite of sargassum everywhere, we managed to scattered action thru out the day, ending with a wild triple header. A LONG RUN BUT GREAT AFTERNOON ACTION! Took us a while to find a body of fish, but when we did it was game on..... Jim Young, who has fished down here many times & Nancy Keil, from Potomac MD & Ed & Lisa Matthews, from Bethesda did a great job catching a triple header and two double headers.... the ladies outfished the guys, but combined they released 15 out of 20 sailfish bites and boated a blackfin tuna which made for some great sashimi! Hooked one every 5 minutes for the first 3 hours....couldn't get out of them, though some would say it was great action, but could not get on the sailfish today..... Leanne Crosseur did catch her first sailfish as did Matt Deboer, both from Michigan, and Leanne's husband Derek boated a nice jack crevale. Tomarrow will be better! We had a very slow day yesterday as did most boats.... we spent the morning searching for some fish, and found them too far away....when we got on them we had good action.... Alex, Jordan, Matt & Step Dykstra & Bradd & Kelly Butler caught 3 out of a 5 banger and six other sailfish....for each their first, along with two blackfin tuna for dinner and too damm many boneheads! SLOW START BUT A GOOD ENDING! 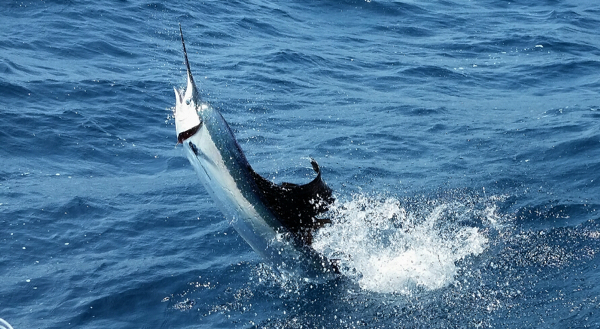 Rough ride north today and took us all morning to get on some fish but had decent action in the afternoon as Craig Sudbrink & crew released 9 sailfish out of maybe 14 or 15 bites. GREEN WATER AND SLOW FISHING! LONG RUNS BUT GOOD FISHING! 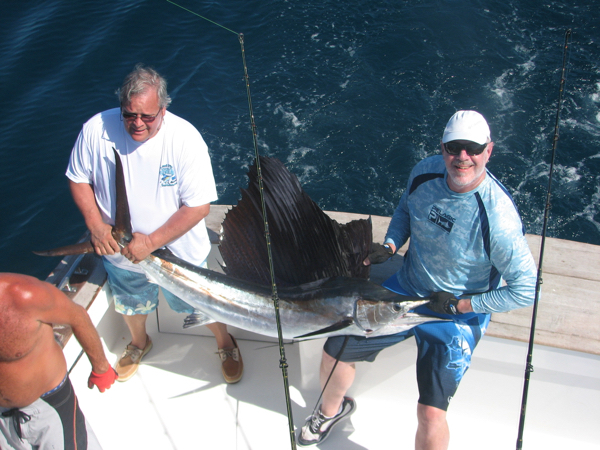 Damm sailfish want to hang out about 40 miles from home, but fishing has been steady....photo below was of Tom Noonan and one of 17 sailfish his group caugth today, along with one 8 lb mahi that made for some great fish tacos! Michael Huling & Ebby Hall, from VA & Tom Berry, from Atlanta have fished with me in the past and they had a few rookies on board, but they did a great job in diffucult conditions today....we had a slow start, but around noon found a spot of birds with a load of sails underneath them, but they were right in the middle of thick windrows of grass....first 5 passes we got nothing but grass but then the guys got going and by quitting time they had released 15 sailfish. Unbelievable amount of sargassum around this year....every day and quite a problem, especially for the mates who for hours some days are shagging grass...hopefully the stuff blows out of here but for now its tough fishing. Had the other day off and went out for dinner at Miguel's, one of the finest new restaurnants on Hidalgo.... 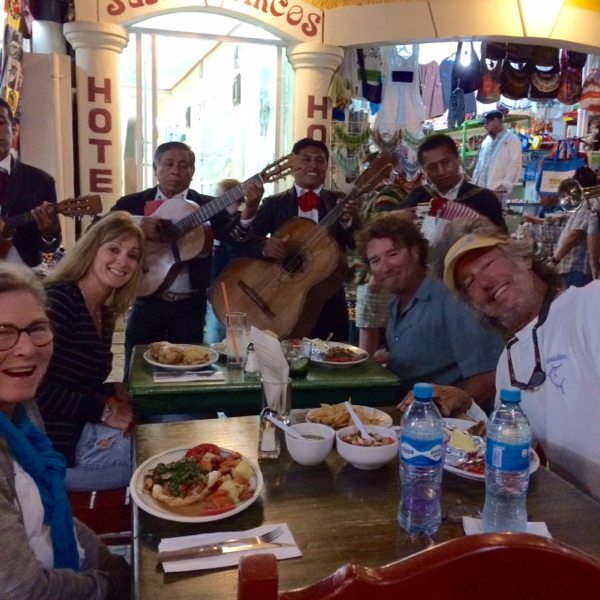 I highly recommend it for great mexican and fantastic seafood creations..... anyway I asked for a small lobster tail but something must have gotten lost in the translation....anyway it was great and nothing was left over! Have the next two days off, and then we get quite busy. SAILS TAKE A DAY OFF! 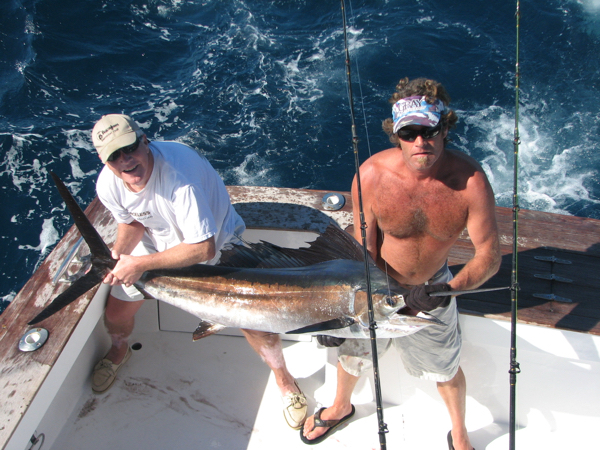 A GREAT WEEK OF FISHING FOR THE JUDGE & THE LAWYER! 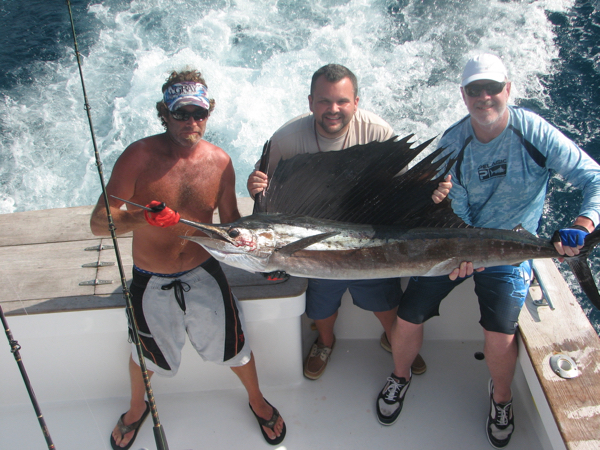 Tom & Mike finished there 5 day stretch of fishing, catching just over 100 sailfish with Anthony & myself..... today they released 16, including a few double headers and a steady pick throughout the day! CALM WEATHER AND GOOD SAILFISHING! 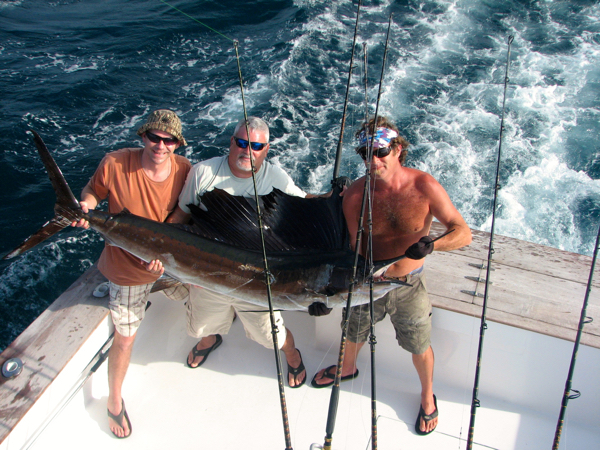 Usually don't get consecutive calm days in January, and we have a few more in styore the next few days..... Had good action all day... not as good as yesterday, and we had to burn a bit of fuel, but Tom Noonan & crew released 15 sailfish out of around 21 bites..... Linda Noonan was the days allstar, releasing 7 herself, and Cirstin also released 3. 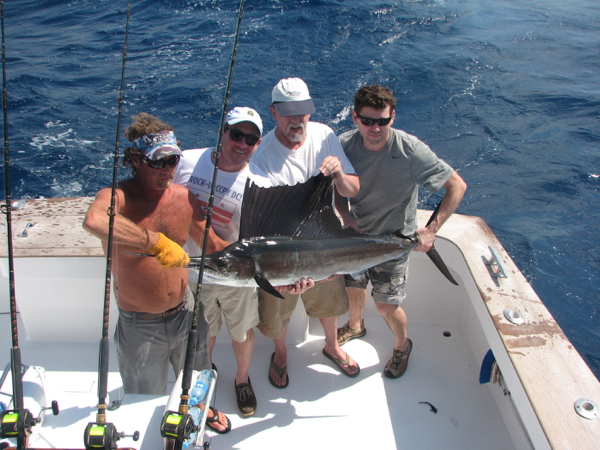 Finally the frigates mellowed out and we has steady trolling action the rest of the day.... Tom & Mike, from Pennsylvania, released 21 sailfish out of around 40 bites, including 4 double headers.